Microsoft’s Office suite has long been an industry mainstay, and whether you're a PC user or a Mac user, you've most likely relied on Word, Excel, and PowerPoint to get stuff done. And as our lives shift off of desktops and onto mobile devices, software is following suit. To that end, the Office suite comes preinstalled as a simple app on every phone running Windows Phone 8. While it's still a far cry from the full-fledged tools offered in the desktop version, Office for Windows Phone 8 lets you perform basic productivity tasks on your mobile handset. The app itself is straightforward, and divided into two panes: Recent and Places. The Recent pane lists all of the files you’ve interacted with lately, while Places lists all of the locations that Office can search for your Word, Excel, and PowerPoint documents. Office for Windows Phone 8 supports Office 365 and compatible email attachments, and SkyDrive integration makes the entire experience decidedly more pleasant. Files stored in your SkyDrive account update automatically, allowing you to work on items stored on the cloud across multiple machines. The app treats all files equally, but to start I'll cover the three main file types: Word, Excel, and PowerPoint. Although Word on Windows Phone 8 lacks most of the bells and whistles of its desk-bound counterpart, it still allows you to create and edit text documents with ease—provided that you don’t mind hammering out prose on your phone's keyboard. Caveats abound, however. For starters, the mobile Word currently lacks support for tracking changes; in fact, you can't do any editing at all on documents for which changes are tracked. It is also unable to edit older Word file formats, so anything you want to work on must have the .docx extension (or be a file that you created on your Windows Phone). To create a new Word document, first open the Office app, and then select the plus sign in the Recent tab.You can select from Word or Excel documents, and the Office app also offers a few commonly used templates for each type of document. 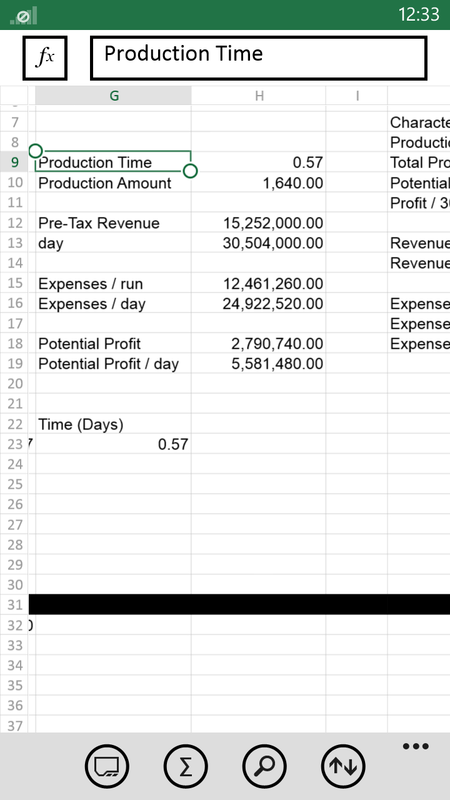 For example, you'll find Word templates for agendas, outlines, and reports, as well as Excel templates for budgets, event schedules, and a mileage tracker. Select Word (or a Word template), and the document will open. When you're done entering your text, tap the ellipsis (More) button to 'save' or 'save as'. The app will ask you to enter a filename and to choose whether to save the document to your phone or to your SkyDrive account. You can also add comments to a Word document. 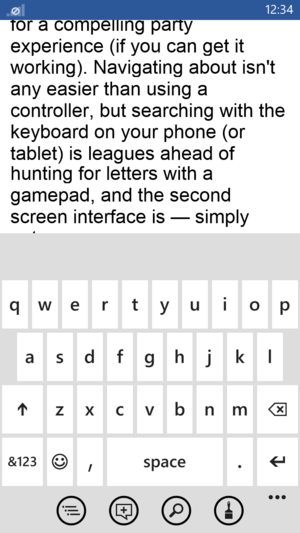 First, tap anywhere in the text to invoke the menu bar, and then tap to select a word. The word should be highlighted. Next, tap the Comment icon, which looks like a word bubble with a plus sign inside. A box for your comment will appear. Type it in, and then tap outside of the comment box to return to your document. The word will remain highlighted, and tapping it will display the comment as well as the name of the user who made the comment. 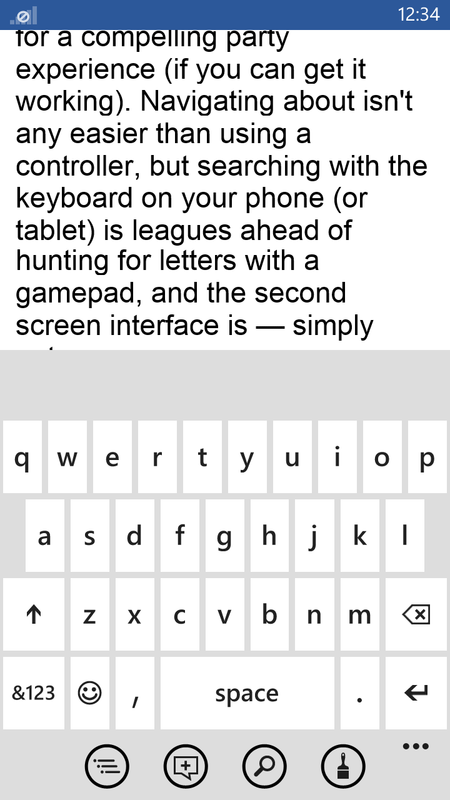 Ultimately, Word on Windows Phone 8 is fairly satisfying, despite the fact that formatting options are sparse. 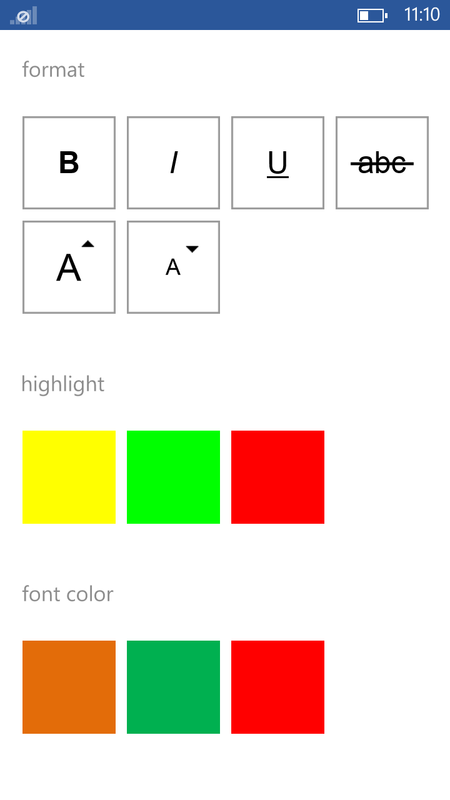 Tapping the brush icon that sits in the menu tray will let you “paint” formatting options onto text you’ve selected. You’ll find standard text options for bolding and italicizing, as well as for changing font size and colors. The tools aren’t quite as robust as Google’s Drive offerings are, and you get no support for collaborative editing—unless you're willing to shell out cash for Office 365. But despite the (admittedly frustrating) limitations, if you’re just trying to get some work done on the go, Word will certainly suffice. Though Excel is the world's most popular spreadsheet program hands down, its transition to mobile operating systems takes some getting used to. Even the roomiest Windows Phone handset doesn't provide much screen real estate for navigating spreadsheets, and the tool can't edit files that involve some of Excel’s more advanced features (such as XML maps). The mobile Excel is also a bit unintuitive: The undo and redo commands are nested behind a menu, while the phone’s back button is the only way to hide the keyboard once you’ve started typing. Opening a new Excel workbook is fairly straightforward. You start by opening the Office app from either the Start menu or the app list, and then you tap the plus sign to create a new document. Once your new Excel document is open, you can add numbers and text by tapping a cell and then tapping in the formula bar to the right of the function command (tapping the function command itself here will display a lengthy list of common functions that you can use). Enter numbers and text in the cell, and tap the enter button—the bent left-facing arrow at the bottom right of the keyboard—to finish. After you're finished entering data, selecting the back arrow button on the home menu removes the keyboard. You can delete data in cells by selecting the cell and then pressing the delete key (an arrow box with an X inside it) on the keyboard. 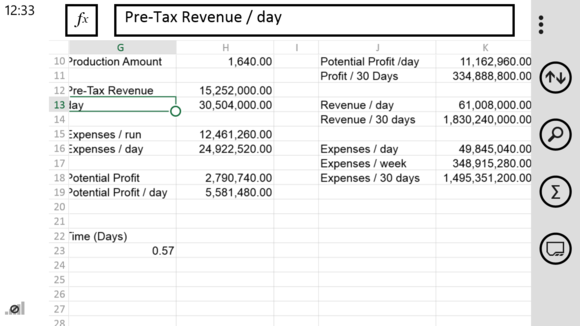 In general, the Excel portion of the Office app has an attractive albeit simple interface: A menu bar running along the bottom of the screen offers buttons for swapping between tabs on your worksheet, using the Auto Sum function, searching your spreadsheet, or sorting rows and columns. The bar is context-sensitive—highlight a few cells, and the search function becomes a charting option. You can also freeze panes to keep rows visible; add comments and format text; and add filters to your spreadsheet’s columns. Excel on Windows Phone 8 isn’t robust enough for exhaustive spreadsheet duties, but its support for basic files and SkyDrive makes it handy in a pinch. 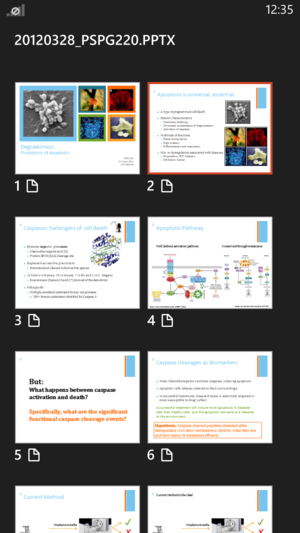 While the mobile incarnations of Excel and Word both make some effort to be functionality-focused, the mobile iteration of PowerPoint is, by contrast, useful strictly as a means of viewing PowerPoint files. Editing is possible only on modern PowerPoint files (those sporting a .pptx or .pptm extension), though “editing” is a bit of a misnomer—you can’t create new PowerPoint presentations on the device, and you're limited to altering text and changing the slide order. However, viewing works like a charm: In our tests, older presentations tended to shed images, but files created with the latest desktop version of PowerPoint worked flawlessly, complete with robust, animated transitions. The app will prove useful for sharing presentations from your phone, but you’ll want to make sure to do the heavy lifting on a proper PC. To open a PowerPoint document, open the Office app and then locate PowerPoint in the Places tab or on the Recent tab (if you want to work on a presentation that you have recently opened). Flick left to go to the next slide in the series; flick right to return to the previous slide. You can reach a specific slide in the series by tapping the Slides icon (four boxes in a square) and then selecting the slide you want to see. You can zoom in and out of a slide by pinching your fingers in and out on the screen. 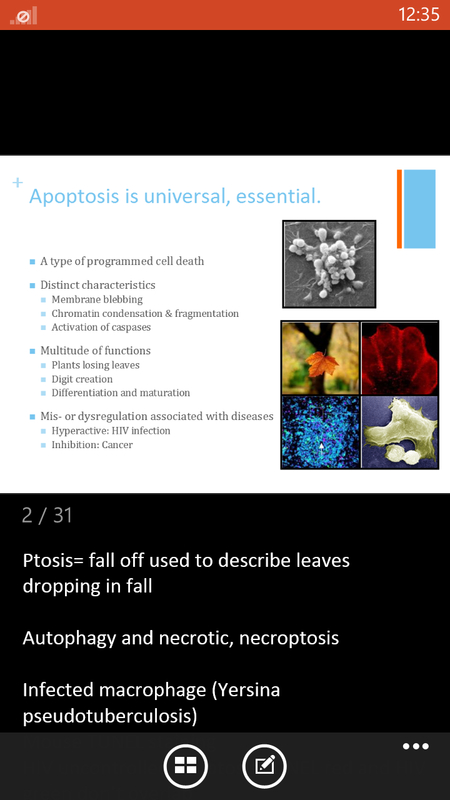 Although you can't fully edit (or create) a PowerPoint slide in this app, you can edit text within a PowerPoint document by going to the slide in question and tapping the edit icon (a box with a pen in it). Select the text by tapping it, make your changes, and tap the Done checkmark button once you're finished. You can also add notes by tapping anywhere in the notes area underneath a slide (if you're in landscape mode, you'll first need to flick up to see the notes area). You can share PowerPoint presentations via email by tapping and holding the presentation from the menu and then selecting share... from the pop-up menu; you can pin presentations to the Start menu or delete them in a similar manner. This story, "Office for Windows Phone 8: Your handy starter guide" was originally published by TechHive.